Welcome to the NEMO III Galapagos cruise accommodation section! 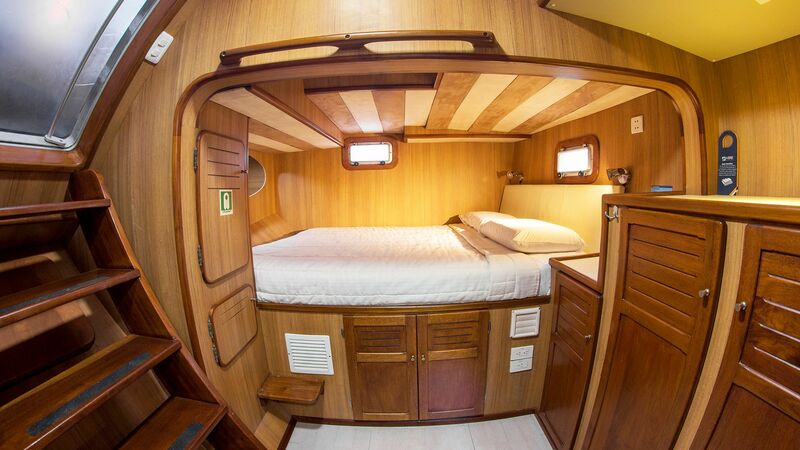 Take a look at our photos below of our cabins that will be your homestay during your NEMO III Galapagos cruise. The NEMO III Galapagos cruise accommodation was recently renovated in 2016. The NEMO III Galapagos island cruise accommodation now has updated en suite bathrooms, beds and extra features such as a reading light to add that extra touch of luxury to your NEMO III Galapagos cruise. The NEMO III Galapagos cruise holds up to 16 passengers, making it the largest among the NEMO Galapagos cruises. 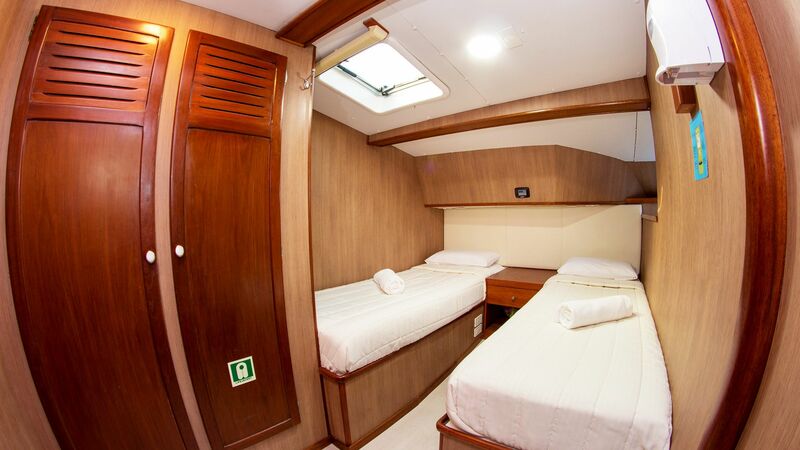 The NEMO III Galapagos cruise accommodation consists of two cabins with two single lower beds, perfect for two adult companions. 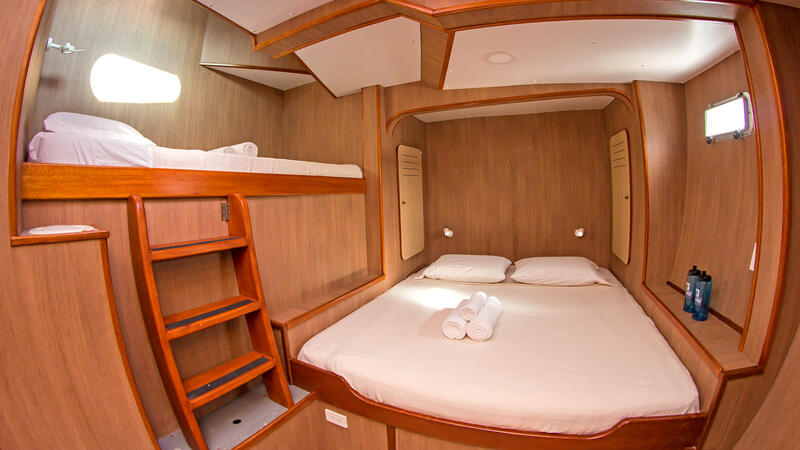 There is an additional three cabins with one lower double bed and one single upper bed in the NEMO III Galapagos cruise accommodation. Last of the NEMO III Galapagos accommodation are three cabins with one double bed especially made for couples. 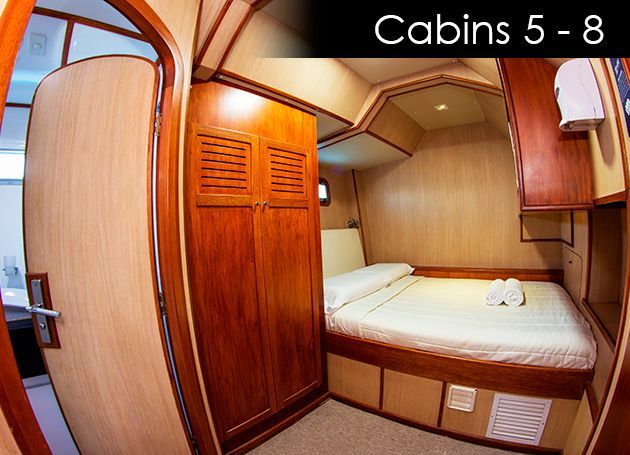 Every cabin has ample space to store your belonging during your NEMO III Galapagos cruise. NEMO Galapagos cruises puts a lot of emphasis on their NEMO III galapagos island cruise accommodation making sure our passengers have a comfortable stay. 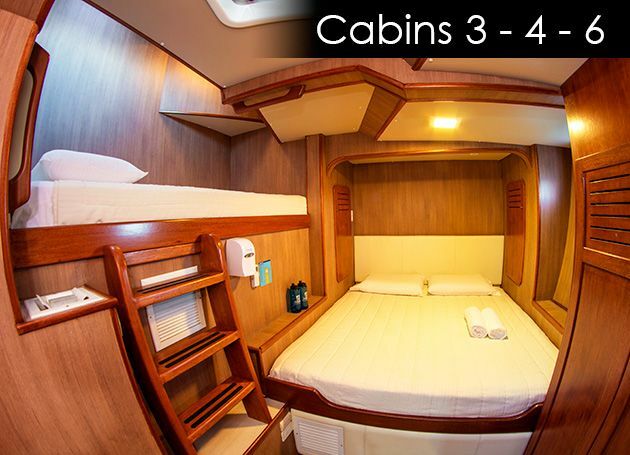 The NEMO III Galapagos cruise accommodations has cabins that appeal to any sort of party in attendance whether it be a single travel, a couple or an entire family we are happy to have you aboard the NEMO Galapagos islands cruises. 1 Cabin with 2 SINGLE BEDS. 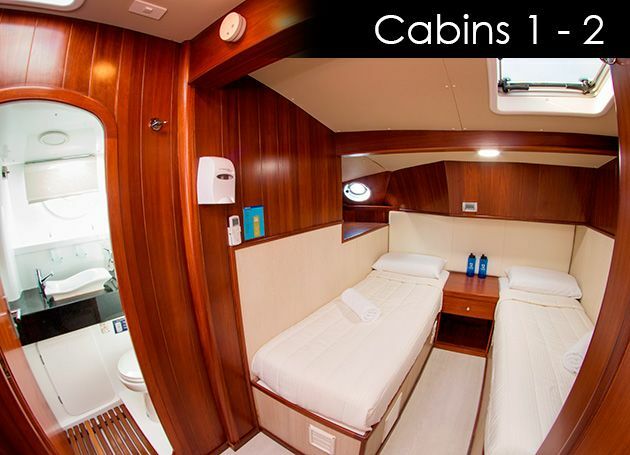 The NEMO Galapagos cruises make sure that all their cabins on every vessel are comfy and appeals to the masses. There are several options to choose from when electing your vacation, so why the NEMO Galapagos cruises? The NEMO Galapagos cruises have been in the business for several decades and many competitors appeal to their strategy to guarantee a successful execution and happy customers. The NEMO III Galapagos cruise follows the same idealism and promises to provide a worthwhile holiday. This includes the immaculate NEMO III galapagos island cruise accommodation that attracts customers worldwide. The NEMO Galapagos islands cruises are unique since they are the only motor-sail catamarans found for cruising around the islands. Outside of your NEMO III galapagos island cruise accommodation you can witness the catamaran traverse through the islands taking in all of its beauty! When you want a moment to relax and outside of the hot weather, the NEMO III galapagos island cruise accommodation is a perfect escape to have some quality “me” time. The NEMO III Galapagos cruise accommodation is a sanctuary for our guests after having a fun filled day. The NEMO Galapagos islands cruises makes sure to keep your NEMO III Galapagos cruise accommodation fully stocked by refreshing toiletries and daily new towels for both personal use and the beach. The NEMO Galapagos islands cruises aims to make sure their passengers are comfortable throughout their voyage. 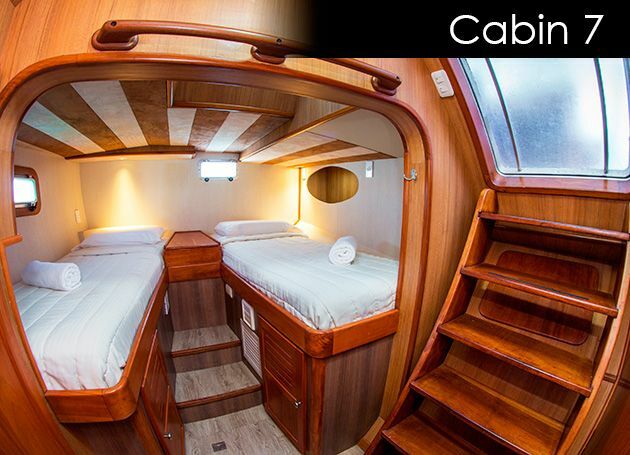 The NEMO III galapagos island cruise accommodation has spacious cabins that appeal to all travelers looking to explore the islands. Take a look at the photos we provide below of the NEMO III galapagos island cruise accommodation that captures the relaxation that we provide to all our travelers.